The body has 12 different meridians or energy channels. Dr. Ben uses a premiere software program called AcuGraph to measure energy imbalances throughout your body. The graph gives added information that makes your acupuncture treatment even more powerful, as we can detect problems you might not even have realized yet. Your body has six meridians that run across your wrist and six that travel across your ankles. Thus, most of the points we utilize fall within the areas from your elbow to your wrist and your knee to your ankle. We will also focus on your specific areas of pain or discomfort, a philosophy known as “Surrounding the Dragon”, and may use points located in your lower back or shoulder. We also use a French system of acupuncture known as Auriculotherapy that uses specific points in the ear to achieve great success in ridding the body of many types of pain and discomfort. For your treatment, you can wear modest clothing or opt for a medical gown. Your acupuncture appointment will begin with your AcuGraph scan. We’ll print your results and go over them with you. Then, just like with chiropractic, we’ll perform an exam, talk with you about your medical history and explain our treatment recommendations. We’ll develop your treatment plan, and show you the specific points we’ll use for your treatment. 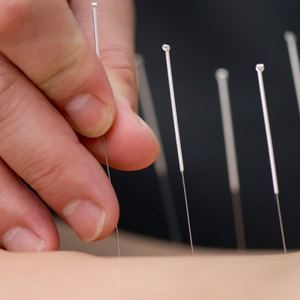 Some patients are apprehensive about the use of acupuncture needles. These single-use needles are about the size of a human hair and are housed within a plastic guide tube. During treatment, you’ll feel gentle pressure on your skin as we press the guide tube to the specific point. Then, a quick tap places the needle. The process is largely pain-free. You may have a sensitive spot or may have a momentary histamine reaction, like an insect bite. Dr. Ben will demonstrate by placing a needle in his hand for you to see. You’ll typically lie on the table for 20 minutes after the needles are placed. In all, your appointment will last about 30 minutes. Like chiropractic, acupuncture is an excellent treatment because we are not putting anything into the body or taking anything out. We are just trying to activate these very specific points over the body that have been shown over hundreds of years to provide terrific relief from many different complaints. Some common complaints that acupuncture can help include headaches, low back pain, stress and anxiety. Are you ready to experience for yourself all that acupuncture has to offer? Contact our office today to schedule your consultation with Dr. Ben and start living your best life.